My husband looooves pizza. But me being Asian, I have used to have a hard time seeing pizza as a meal. When we went to the Philippines in 2005, we ordered pizza with my cousins around dinner time. After finishing two large pizzas, one of my cousins asked what we were having for dinner. My husband was flabbergasted because he was sure that we just ate our dinner. He had so much to learn, but quickly found out that what we just had was merienda (snack between lunch and dinner). You see, pizza lacks rice. And without rice, it's just not meal. I no longer feel that way about pizzas. But sandwiches? Well, that's a different story. 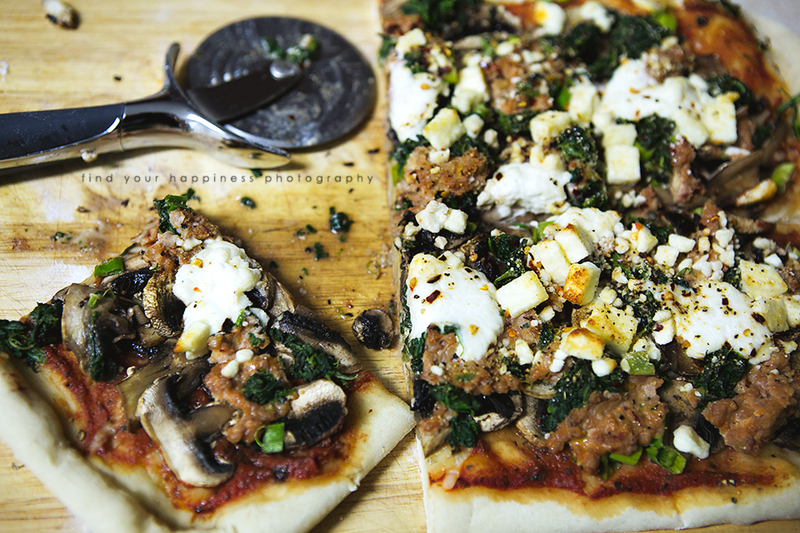 Toppings: Spinach, mushroom, green onions, turkey sausage, feta and ricotta cheese. Pizza is not my favorite food but I will eat it as long as it is made with fresh dough and the freshest ingredients/toppings. I know that sounds a little snobbish but there's just something about processed or delivery pizza that is a major turn off for me (too greasy maybe?). But when we make it ourselves at home? Umm-ummm-ummm! I'm in heaven. It is also a great, quick meal for me to prepare and a great way to clean the fridge :) Just pile on whatever you have or craving that day. Can't beat that! Combine wine, water and yeast in a medium bowl until yeast has dissolved. Add honey, salt and olive oil and stir. Add flour and only add one tablespoon of flour if you really need to. Knead the dough on a floured surface for two minutes. Coat the inside of a clean bowl with olive oil and put the dough in. Rub olive oil on the dough to keep it from drying and then cover it with plastic wrap. Place the bowl in a warm area and let rise for one to two hours, until doubled in size. Once it has doubled in size, gently punch the dough to deflate and turn it onto a floured surface. Form the dough into a ball and let it rest, covered. After 5-10 minutes, the dough is ready to roll out. Brush the sides with oil or water. After adding the sauce and toppings of your choice, bake in a pre-heated oven at the highest setting for 10 minutes. Slice and serve immediately. In a small saucepan over low to medium heat, combine all ingredients. Simmer for 15 minutes. Let cool for 30 minutes (or more) to give the flavors time to blend. Spread over pizza dough and prepare as desired.